Description: Theoretical, experimental, and numerical exploration on the problem of training frictional granular media to gain configurational memory. Professor Itamar Procaccia, Department of Chemical and Biological Physics, Weizmann Institute of Science, Israel. Professor H. George E. Hentschel, Department of Physics, Emory University, USA. Dr. Jacques Zylberg, Department of Chemical and Biological Physics, Weizmann Institute of Science, Israel. Dr. Saikat Roy, Department of Chemical and Biological Physics, Weizmann Institute of Science, Israel. Dr. V. Sathish Akella, Nonlinear and Non-equilibrium Physics Unit, OIST Graduate University, Japan. Professor Mahesh M. Bandi, Nonlinear and Non-equilibrium Physics Unit, OIST Graduate University, Japan. In this work, we collaborated with the group of Prof. John Dolbow at Duke University and Prof. Eliot Fried at OIST Graduate University to develop a simple continuum model that captures the main features of the surfactant-driven fracture of closely-packed particulate monolayers. The model naturally gives rise to a dimensionless parameter that can be written solely in terms of the surface tension with and without surfactant. This parameter can be used to establish a straightforward comparison with experimental conditions. New experiments were conducted to validate the model and delineate the regimes of fracture pattern as a function of the dimensionless parameter. Consistent with experimental evidence, the model and experimental incorporates a competition between the spreading force of the surfactant and the fracture toughness of the monolayer. We find that the number of fracture branches is governed by that competition. The third image, Figure 3, is a single image with the caption below it. Figure 1: Experimental (top) and simulation (bottom) images of surfactant driven particulate fracture patterns. Surfactants such as soap when introduced at a liquid interface give rise to Marangoni stresses that drive a flow. This fundamental process of surfactant spreading, governed by its diffusion and transport via self-induced flow has many applications from materials chemistry to biomechanics. Most surfactants we use are soluble in the fluid and can be transported in a phase dissolved in the bulk or adsorbed at the interface. But a complete description of the resulting flow is hindered by the complexity of surfactant dynamics, which includes characterizing the equilibrium adsorption characteristics, the adsorption-desorption kinetics and transport by the flow. Whereas methods based on molecular or radiometric markers can measure surface excess during a flow, low surfactant diffusivity into bulk fluid renders bulk concentration measurements at the interface difficult during flow. Direct Marangoni stress measurements via in situ surface tension gradient measurements are equally challenging. 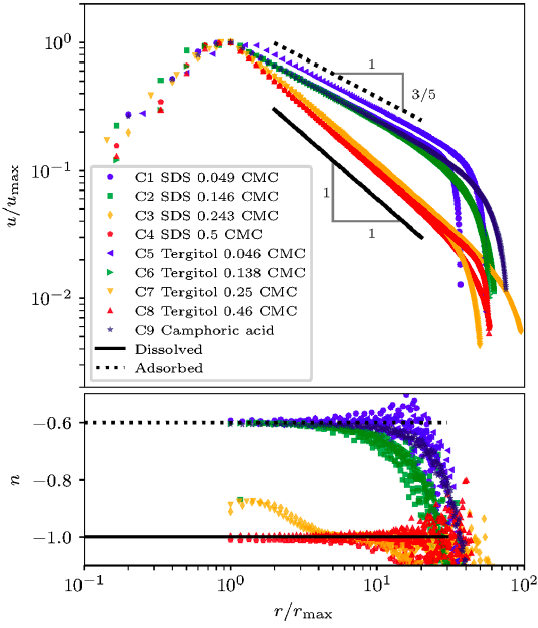 Simultaneous access to bulk and surface concentrations, Marangoni stress, sorption kinetics, and their subsequent correlation with each other to deduce the surfactant dynamics present an experimentally formidable task. 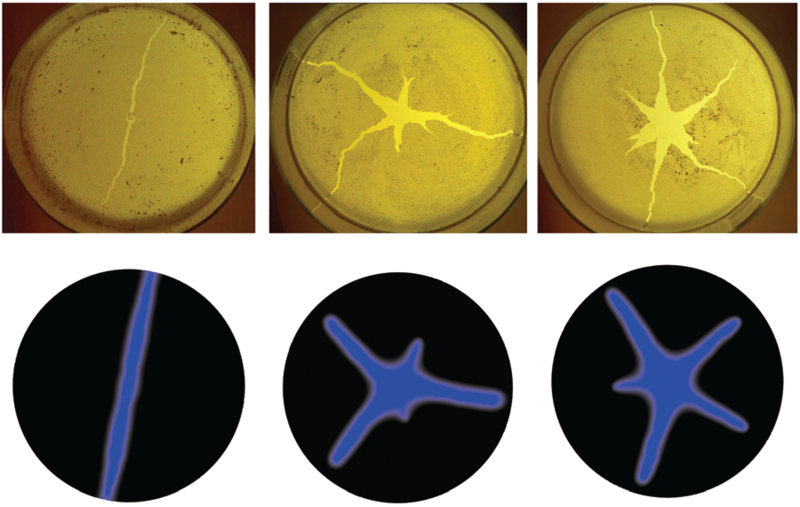 In this work, we performed a set of experiments in stationary Marangoni-driven surfactant transport to discriminate between two limiting scenarios: one where the surfactant remains adsorbed at the interface as it spreads and the other where it dissolves into bulk fluid during the spreading. We demonstrated that it is possible to distinguish between these two limiting cases through purely hydrodynamic signatures, without using any knowledge of the surfactant physicochemical properties because either of these assumptions reduces the complexity of the problem by enabling semianalytical steady solutions to the governing equations. The objective in this setting then becomes one of experimental validation of these assumptions using hydrodynamic measurements alone. Figure 2: One of the three hydrodynamic signatures experimentally measured with the setup in figure 1, the radial velocity of surfactant emanating from the point source. Ray-finned fish, or Actinopterygii, use their fins as a general purpose device to manipulate the surrounding fluid. That the rayed structure of the fin is found in greater than 99% of all living fish species is a testament to its versatility in the aquatic environment. The fin is used in a wide range of manoeuvres, from holding stationary in spatio-temporally varying turbulent flows to explosive bursts of motion. Insight into design principles underlying its biomechanics could therefore shed light on the reason behind its overwhelming dominance in the aquatic realm, and find applications in underwater robotics. The mechanical stiffness of the fin is a key parameter that influences its propulsive performance. Which structural elements might be responsible for the fin’s stiffness? The fin stiffness under bending deformations is tacitly assumed to equal the individual ray bending rigidity multiplied by the number of rays. Experimentally, an individual ray’s bending rigidity is estimated by supporting it in a cantilevered loading and measuring the displacement at a point where a force is applied to deform the ray. In this work, we show using a mathematical model that fin curvature along a direction transverse to the rays stiffens it to bending beyond this simple picture. The mechanism of this stiffening underlies the common observation that, under its own weight, a flat sheet of paper droops but a slightly curved sheet stiffens and barely deforms. Curvature couples out-of-plane bending of the sheet to its in-plane stretching; the in-plane elastic properties of the sheet thus become relevant in determining its stiffness. Figure 1: Schematics for a model fish fin. (a) A prototypical fish fin has multiple bony rays which attach to a common fin base and are held together by tissue membranes. (b) We model the fin using elastic beams for rays and distributed springs for membranes. The rays and membranes are of length L and approximate a transverse curvature by tracing a constant circular arc. S Basu, A Yawar, A Concha and MM Bandi, "On angled bounce-off impact of a drop impining on a flowing soap film" Fluid Dyn. Res. 49, 065509 (2017). C Peco, W Chen, Y Liu, MM Bandi, JE Dolbow and E Fried, "Influence of surface tension in the surfactant-driven fracture of closely-packed particulate monolayers" Soft Matter 13, 5832 (2017). KD Nguyen, N Yu, MM Bandi, M Venkadesan and S Mandre, "Curvature-induced stiffening of a fish fin", J. Roy. Soc. Interface 14, 20170247 (2017). MM Bandi, "Spectrum of Wind Power Fluctuations" Phys. Rev. Lett. 118, 028301 (2017). M Venkadesan, MM Bandi and S Mandre, "Biological feet: Evolution, mechanics and applications", Chapter 7.1: Bio-inspired Legged Locomotion, Editors. M. Sharbafi and A. Seyfarth, Elsevier Science (2017). [Poster]MM Bandi, VS Akella, DK Singh, RS Singh, S Mandre, "Hydrodynamic signatures in stationary Marangoni-driven surfactant transport", Gordon Conference on Soft Matter, New Hampshire (2017). [Seminar]MM Bandi, VS Akella, DK Singh, RS Singh, S Mandre, "Hydrodynamic signatures in stationary Marangoni-driven surfactant transport", Department of Physics, Syracuse University (2017). [Seminar] MM Bandi "The spectrum of wind power fluctuations", Department of Civil Engineering, Tufts University (2017). [Seminar] MM Bandi "The spectrum of wind power fluctuations", Department of Mechanical Science & Engineering, University of Illinois at Urbana-Champaign (2017). [Oral Presentation] F Paraz and MM Bandi, "Eulerian point to field convergence in higher-order turbulence spectra" APS Division of Fluid Dynamics Annual Meeting (2017). [Oral Presentation] HM Paroor, N Nambiar, MM Bandi, "Test of the fluctuation relation in self-propelled camphor boat dynamics" APS March Meeting (2017). [Oral Presentation] MM Bandi, VS Akella, "The Granular Pebble Game" APS March Meeting (2017). [Seminar] MM Bandi "The spectrum of wind power fluctuations", Energy cluster seminar, University of Pennsylvania (2017).